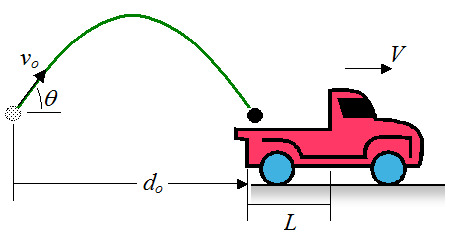 On this page I put together a collection of projectile motion problems to help you understand projectile motion better. The required equations and background reading to solve these problems is given on the projectile motion page. I also provide hints and numerical answers for these problems. Refer to the figure below (along with sign convention shown), for problems 1-7. Use g = 9.8 m/s2. For problems 1-6 and 8, ignore air resistance in your calculations. For Δdy = 0 and for any given vo find θ so that the range (Δdx) is maximum. Find the maximum height (h) and range for vo = 10 m/s, θ = 30°, and Δdy = -10 m. What is the flight time? 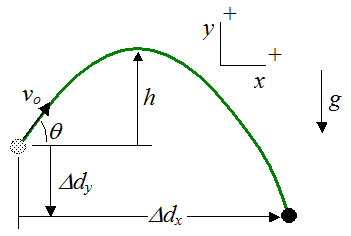 Find the maximum height and range for vo = 10 m/s, θ = 30°, and Δdy = 1 m. The displacement Δdy corresponds to the stage of the projectile flight where it is moving downward. What is the flight time? Find Δdy for vo = 10 m/s, θ = 30°, and Δdx = 15 m. What is the flight time? Find the maximum height and range for vo = 10 m/s, and θ = 90°. Find the maximum height and range for vo = 10 m/s, θ = 0, and Δdy = -5 m.
Find the maximum height and range for vo = 10 m/s, θ = 30°, and Δdy = -10 m. Account for air resistance, with drag coefficient equal to 0.47, projected frontal area equal to 0.01 m2, density of air equal to 1.2 kg/m3, and mass of projectile equal to 0.1 kg. Compare this to the answer in problem 2. The hints and answers for these projectile motion problems will be given next. Referring to the projectile motion page, set vx = vocosθ and v1y = vosinθ. Obtain an explicit expression for time t based on the quantities v1y and Δdy, and find θ so that Δdx is maximum. Refer to the projectile motion page. To find maximum height set v1y = vosinθ. We know that at maximum height there is zero vertical velocity (v2y = 0). There is a specific equation on the projectile motion page which you can use to solve for the maximum height when v2y = 0. To find the range you first need to find the total time t the projectile is airborne, and then you can use this time to find the range Δdx = vxt where vx = vocosθ. This problem is similar to problem 2 so the hint for it applies here as well. Note that there are two solutions for time t which correspond to Δdy = 1 m. You must choose the largest time t corresponding to the stage of the flight where the projectile is moving downward. Given known Δdx = (vocosθ)t, with vo and θ known, find t and then use this t to find Δdy using the equation for vertical displacement (Δdy) on the projectile motion page. This projectile motion problem involves strictly vertical projectile motion, which means there is no horizontal velocity component to consider. This projectile motion problem involves initially horizontal projectile motion, which means there is no initial vertical velocity component to consider. You need to solve this with numerical methods which accounts for the effects of air resistance. I created a projectile motion simulator to solve problems like this. When the ball begins to enter the trunk, the horizontal distance Δdx traveled by the ball is given by Δdx = (vocosθ)t, which is also equal to the distance do+Vt for minimum vo and do+L+Vt for maximum vo, where t is the total time. To determine the total time t set Δdy = 0, and solve for t. You can then solve for minimum vo and maximum vo. Projectile motion problems like the ones given above are a good way to test understanding. To see an interesting real-world application of projectile motion go to The Physics Of Volleyball. Also, see the problem, Maximum shot put distance. 2. Can a football fly farther if it is filled with helium? 3. Can a bullet fired straight up in the air kill someone on the way back down? 4. If a person jumps out of an airplane with the last parachute, can another person jump out later and catch the person? 5. Does a 4,000 foot fall take 90 seconds? 6. Will a car dropped from 4,000 feet fall faster than a speeding car? I created a physics analysis for these six problems, in PDF format. It's available through this link.